More than 50 employees of Spencer Savings Bank, a community bank headquartered in Elmwood Park, N.J., participated in the Making Strides Against Breast Cancer walk in Ridgefield Park, N.J. on Sunday, Oct. 16, 2016. Over the course of two months leading up to the event, Spencer raised $9,000 benefitting the American Cancer Society, the organization behind the national Making Strides initiative. The fundraiser included selling chocolates, lapel pins, bracelets and paper trophies at branch offices throughout Northern New Jersey. The bank also held a variety of fundraisers at its headquarters in Elmwood Park. 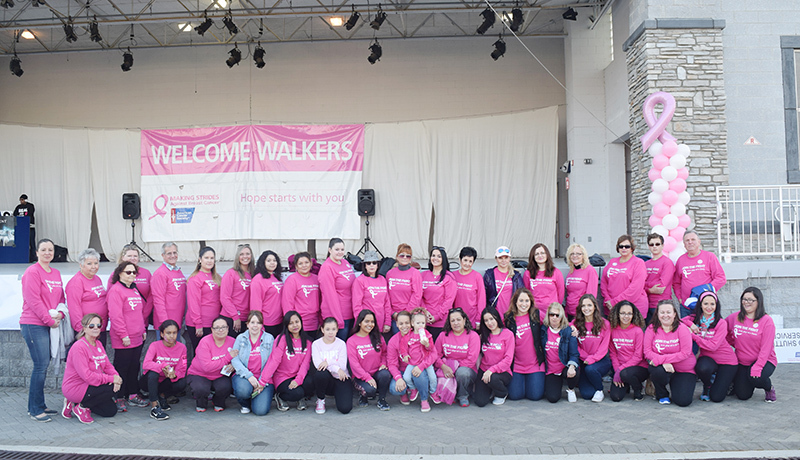 Making Strides of Ridgefield Park 2016 was an enormous success, drawing nearly 10,000 walkers and putting the organization on track to raise roughly $464,000 by the end of the year. The funds are allocated toward groundbreaking breast cancer research, life-saving education, and critical patient services. 2016 marked the third consecutive year that Spencer has participated in this event.